Palestinian Popular Struggle challenges conventional thinking about political action and organization. It offers an alternative to the seemingly failed tracks of armed struggle and diplomatic negotiations. A discourse of rights and global justice helps bridge national and religious divides, drawing Jewish Israelis and diverse supporters from around the world to participate in direct-action campaigns on the ground in the West Bank. The movement has some important achievements and continues to offer innovative approaches to the Israeli–Palestinian conflict. This book summarizes Palestinian traditions of popular struggle and presents original field research from the West Bank, drawing on several months of participant observation, over twenty-five hours of recorded interviews with Palestinian activists, and more than 200 questionnaires gaging public perceptions about the strategies of the popular committees. One of the book’s major case studies is the village of Nabi Saleh, which recently became well known when one of its activists, a sixteen-year-old girl named Ahed Tamimi, was imprisoned for slapping Israeli soldiers outside her family home. The book offers insight into new waves of Palestinian popular protest, from the 2017 prayer protests in Jerusalem to the 2018 march of return in Gaza. 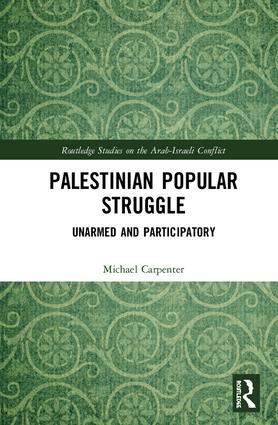 Palestinian Popular Struggle is a valuable resource for researchers and students interested in War and Conflict Studies, Politics and the Middle East. Michael J. Carpenter is a post-doctoral fellow with Borders in Globalization at the Centre for Global Studies, University of Victoria, Canada. His research interests include participatory governance, civil resistance, Middle East politics, international relations, and political theory.